I've got metal ones, wooden ones made from beech (Fagus spp.) and boxwood (Buxus sempervirens) and one made from stainless steel, but none compare to the maple (Acer saccharum) flat-soled spokeshave from Woodjoy for unadulterated simplicity. 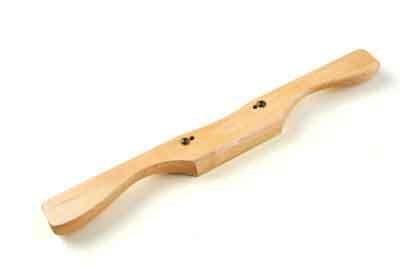 Firstly, I don't have a great need for a spokeshave in my work, although I can't imagine a life without them. Either I've found a series of effective work-a-rounds, or their capabilities have just gone unnoticed. Maybe it's the blade-holding mechanism on the Woodjoy 'shaves that make them so user-friendly. A small hex nut arrangement clamps the blade in place so that minute adjustments can be made and, more importantly, maintained. There's no backlash and a sloping projection can be obtained. Made from wood and therefore light, when the blade becomes dull, you notice a drop-off in performance immediately. With very little sole referencing the workpiece, I find the more feedback I have from the tool, the better. In some circumstances, extra mass can have you struggling on for longer than is good for you. And when it's time to sharpen, there are no posts to get in the way. A great tool to have and one that might open up a few new opportunities.